Times Internet seems to be on an acquisition spree. Since start of this year, they have already made 3 different acquisitions (recently Gaana acquired Musicfellas and TimesCity acquired Dineout ), and now have made announcement for the fourth. Times Internet , a digital product company and a part of The Times of India Group, announced today that it have acquired a majority stake in Mumbai-based CouponDunia Media Private Limited, which owns and operates CouponDunia.in, one of the leading coupon marketplace in India. The terms and financials of the deal were not disclosed. Times Internet also owns and operates Times Deal, which is in the similar space and post the acquisition both these platforms will merge to form a single entity. According to press release sent to us, CouponDunia will retain its identity, which means TimesDeal will cease to exist and operate under CouponDunia brand. CouponDunia was founded in 2010 and currently serves coupons for over 1500 online brands and has over 1 million subscriber base. They also currently have presence in 4 other countries; CupomWorld in Brazil, KuponDunya in Turkey, KodyBony in Poland and CouponDunia Indonesia. 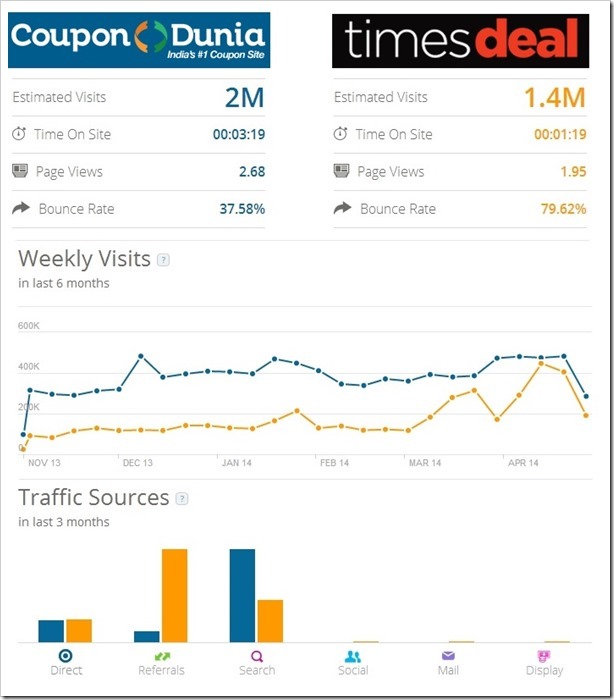 Here is the traffic and engagement comparison (based on similarweb) of CuponDunia.in and TimesDeal.com. The graph clearly points to fact that both these sites will complement each other quite well. While CouponDunia is quite high on organic search traffic, TimesDeal is high on referral traffic. The combined entity will surely benefit from the referral traffic generated by various Times properties, which will also mean that CouponDunia will lead Indian coupon & deals space by a fair margin. We think CouponDunia is yet another great acquisition by Times Internet! "Times Internet Acquires Majority Stake In CouponDunia", 5 out of 5 based on 1 ratings. Is Café Coffee Day Planning An IPO Valued At $1 Billion?